Brimful Curiosities: A WordWorld Giveaway! Last Sunday I reviewed the recent WordWorld Holiday special that is currently airing on PBS as well as one of the toys available in the WordWorld toy line-up. Today, due to a lucky break, I am posting a corresponding giveaway just for you! WordWorld, the popular children's PBS preschool show, is airing a new holiday special this December. We were offered a chance to watch the advance holiday screener and my daughter loved it! The episodes titled The Christmas Star and A Christmas Present for Dog will air several times beginning Dec. 1st. Make sure to check your local television listings to find out when it is on in your area! Win a WordWorld product! WordWorld has kindly offered to sponsor a giveaway. 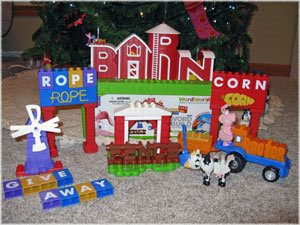 Two prizes will be awarded for this giveaway: One (1) Winner will win a Mega Bloks WordWorld Bucket Set - Barn. One (1) second-place winner will receive a copy of the WordWorld Holiday Episode Screener DVD. To enter, put on your creative thinking caps! In the comment section, let me know a word you would like to see depicted as a WordFriend or WordThing on the PBS WordWorld show. • Winners will be chosen at my discretion based on the best answers to the above question and contacted by email. My daughter loves to look and point at different colors. I would love to see episodes focusing on and spelling different colors! oh YAY..this is so super cool! I think this show is great as is. Maybe different flowers? Or colors? Or shapes? I'd like to see more animals....maybe zoo animals. My girls love WordWorld, and I think the creative concept behind it is excellent! I'd love to win this giveaway for them, so my suggestion for a new word character or word thing is UNICORN. My daughters both like unicorns, so I think it would be fun to see this one concept brought to life. I'd love to see a WordWorld about sea animals, with fish, dolphins, crabs, sharks, seaweed, etc as word characters. My kids love WordWorld!! I think it'd be fun it they had an episode that focused on how to say words in different languages. That'd be fun!! My youngest loves trains so it would be cool to see TRAIN or even different train cars like engine, boxcar, tanker, caboose, and track, signal, etc. I think they already have one with farm animals, which is another of his favorite things :). I know this may sound a little strange but I would like to see the word Danger. It would be a great learning opportunity for the little ones. Word World is a fav @ our house. My eldest son LOVES alligators, so he'd flip to see an alligator on there! How about "chocolate". Yes, it is a long word but one that everyone should know! My daughter would love to see a horse! Safari Animals would be neat. Thanks! Recycle in the shape of recyclable items. more animals, I think, like alligator! I would like to see more color words. wow this is realy neet i lovee to try and win this for my little one i think she find it to be realy neet and fun to play with also this kind of toy may help her with her talking . How about an action one with words such as JUMP, RUN, or SNAP? I think a smiley face character with little legs & arms would be cute. I would like to see different vegetables featured! 'doctor' or 'nurse' or anyone in the medical prof. would be interesting to teach young ones that they save lives! How about GIVE - my kids are really starting to grasp the idea of giving is = to or better than receiving! How about spot? It has several connotations. How about numbers? There is so much you could do with the word number! Rescue vehicles. Fire truck, ambulance, etc. What great products! I'd love to see words that inspire children to be aware of their carbon footprint, such as recycle, reuse, etc. Thanks for the great giveaway!